How are home based business opportunities saving the American Dream? This is the land of opportunity. How can the American Dream fade? Is there a scarcity of opportunity? Throughout our history, we have seen the American Dream in action. From the settlers heading west in covered wagons to Oregon and California to create a better life, Black Americans moving north from the south, and to the folks in Appalachia moving to the mid-west to work in the steel mills and factories after World War II. So How is the American Dream Doing Today? Not so well these days! The New York Times, in their article “The American Dream, Quantified at Last,” reported on an economic study done by a Stanford University team. Their research was titled the “Equality of Opportunity Project” focusing on improving the economic opportunities of our children. 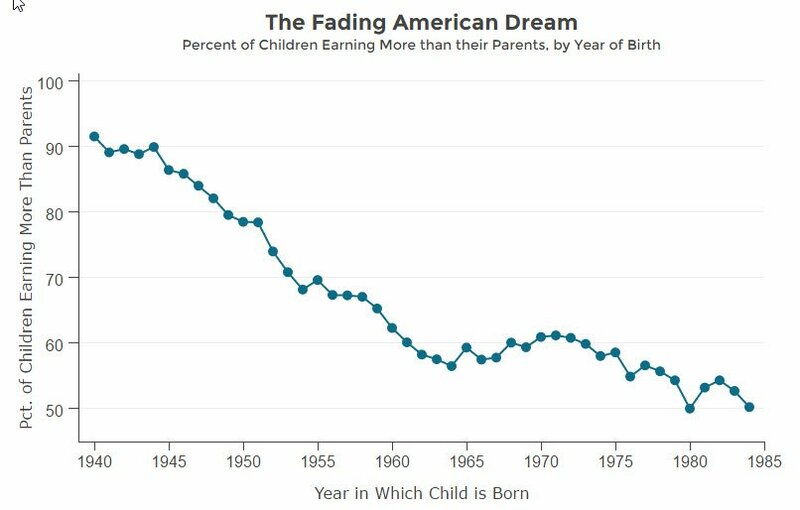 Their research data shows that the American Dream is fading. The following chart from their research (equality-of-opportunity.org) shows this. Why is the American Dream Fading? 50% of Americans say they are financially insecure. A Study by the Pew Charitable Trusts shows that many Americans are worried, stressed out, and have the feeling that they were left out of the economic recovery from the last recession. That does not speak well for our ability to plan for retirement or for the future of our children. Upward mobility is fading fast. Who is the blame for all this? Somebody has to take the blame. Right? If we are a victim, then there must be a perpetrator. It must be the System, the Man, the government, my bad luck, the rich, the one percenters, the elites, the current administration, the increase in secularism, and so many others. J.D. Vance in his 2016 best-selling book, “Hillbilly Elegy: A Memoir of a Family and Culture in Crisis” tells his story of his upward mobility from the crushing poverty of Appalachia (rural Kentucky) to the struggle to graduate from Yale Law School. He talks of the unequal opportunities, loss of jobs, drug abuse, family problems, and poverty common to Appalachia (as well as other regions). My conclusion from Vance’s book is that to achieve success, it is up to the individual to succeed by overcoming obstacles in the way. This may be simplistic, but relying on others such as the government has not and will not work. Individuals and their communities need to work to solve their own problems. First, people should recognize that society is evolving. We have gone from an agricultural-based society to an industrial society. And now an informational based society. Technology, for better or worse, continues to change our economic life. These are societal changes, but what about the individual, you? Entrepreneurs like you continue to create new businesses, new jobs, and new wealth. Home based business opportunities will continue to drive the American Dream once people recognize that it is up to them to create a better life for themselves. Are you the next Jeff Bezos? Or Debbi Fields? I would love to hear your opinion. Just fill in and submit the form below.